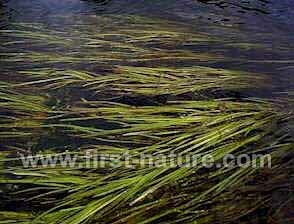 These submerged weeds have leaves up to two metres long. The tiny flowers are green and have no petals, and so are rarely seen. Anglers sometimes refer to this weed as 'eel grass', but that name is correctly reserved for Zostera marina, a weed of the inshore waters.